We may long for wholeness, suggests Jon Kabat-Zinn, but the truth is that it is already here and already ours. The practice of mindfulness holds the possibility of not just a fleeting sense of contentment, but a true embracing of a deeper unity that envelops and permeates our lives. With Mindfulness for Beginners you are invited to learn how to transform your relationship to the way you think, feel, love, work, and play--and thereby awaken to and embody more completely who you really are. Here, the teacher, scientist, and clinician who first demonstrated the benefits of mindfulness within mainstream Western medicine offers a book that you can use in three unique ways: as a collection of reflections and practices to be opened and explored at random; as an illuminating and engaging start-to-finish read; or as an unfolding "lesson- a-day" primer on mindfulness practice. The prescription for living a more mindful life seems simple enough: return your awareness again and again to whatever is going on. But if you've tried it, you know that here is where all the questions and challenges really begin. Mindfulness for Beginners provides welcome answers, insights, and instruction to help us make that shift, moment by moment, into a more spacious, clear, reliable, and loving connection with ourselves and the world. Includes a complete CD with five guided mindfulness meditations by Jon Kabat-Zinn, selected from the audio program that inspired this book. The "Curriculum" is "Just This"
Jon Kabat-ZinnJon Kabat-Zinn, PhD, is the founder and director of the Stress Reduction Clinic at the University of Massachusetts Medical Center and associate professor of medicine in the Division of Preventative and Behavioral Medicine. His clinic was featured in 1993 in the public television series Healing and the Mind with Bill Moyers. 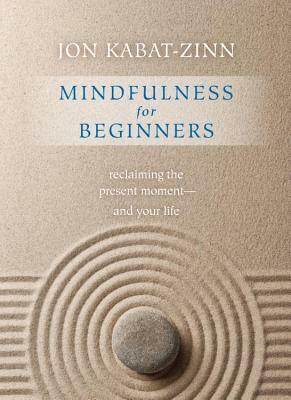 Jon Kabat-Zinn is the author of Wherever You Go, There You Are: Mindfulness Meditation in Everyday Life and Full-Catastrophe Living: Using the Wisdom of Your Body and Mind to Face Stress, Pain and Illness.